When you have a circle, a tangent is perpendicular to its radius. It touches (intersects) the circle at only one point and looks like a line that sits just outside the circle&apos;s circumference. The fact that it is perpendicular will come in useful in our calculations as we can then make use the Pythagorean theorem. 1) A tangent is perpendicular to the radius at the point of tangency. 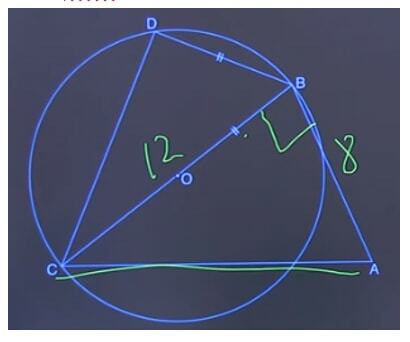 2) Tangent segments to an external point of a circle are equal. 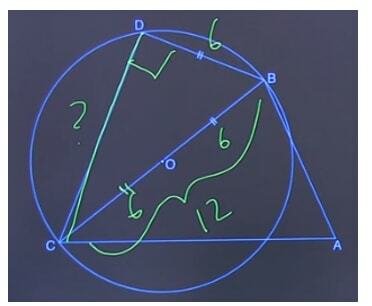 3) The angle between a tangent and a chord is equal to the inscribed angle on the opposite side of that chord. You&apos;ll see these properties in use in the practice problems coming up when dealing with a (or several) tangent line on a circle. 1) If two chords&apos; lengths are equal in a circle, they are equidistant from the center. 2) The longest chord in a circle is the diameter and it passes through the center of a circle. 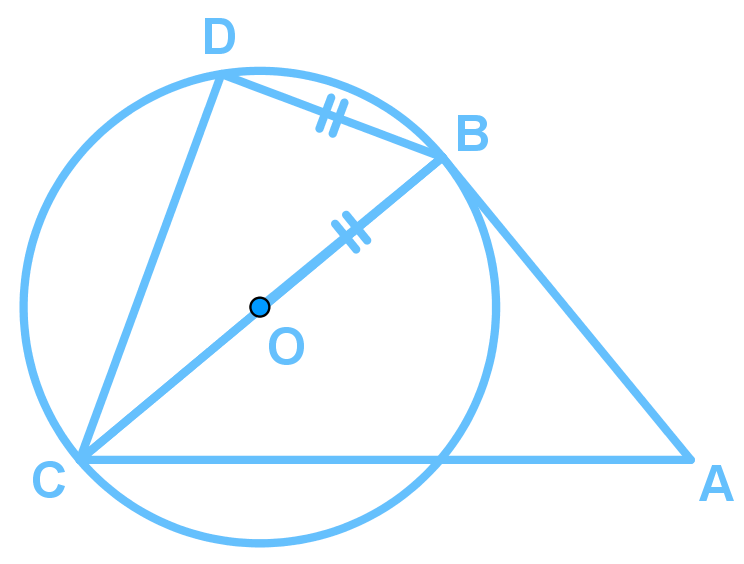 3) A perpendicular bisector of a chord passes through the center of a circle. Understanding chords will help you tackle problems dealing with tangents. Triangle CDE is an isosceles triangle. Point A is the center of the circle. Point D and point C are point of tangency to the circle. 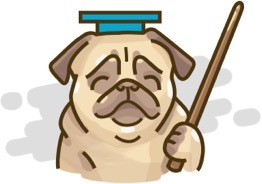 Line AD and line AC are perpendicular to the tangent line. Therefore, Angle ACE = 90°. 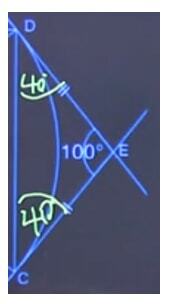 Angle CDB is an inscribed angle of the diameter. So, Angle CDB = 90°. 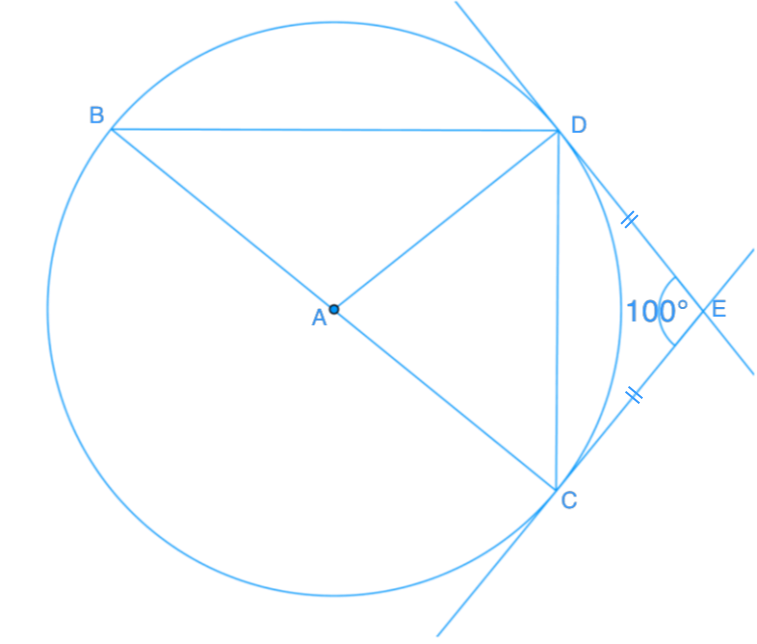 In the diagram below, BC is a diameter, and AB is tangent to the circle at point B. OB = 6 cm, and AB = 8 cm. Find the length of the chord DC. 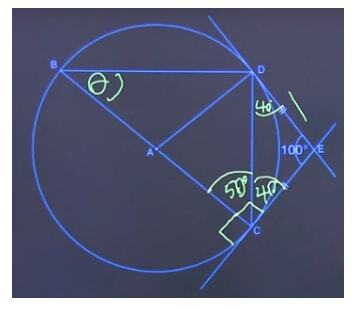 Check out this online calculator to help you figure out the lengths of the tangents of a circle. Ready to build off on this lesson? Learn about the arcs of a circle, area of a circle, and central and inscribed angles. A tangent to a circle must form a perpendicular line from the point of tangency to the center of the circle. In this lesson, we will learn how to use this property, along with others such as, chord properties, to solve questions. What are the properties of a tangent? Find the length of the diameter. Justify if △\triangle△CBD is a right angle. 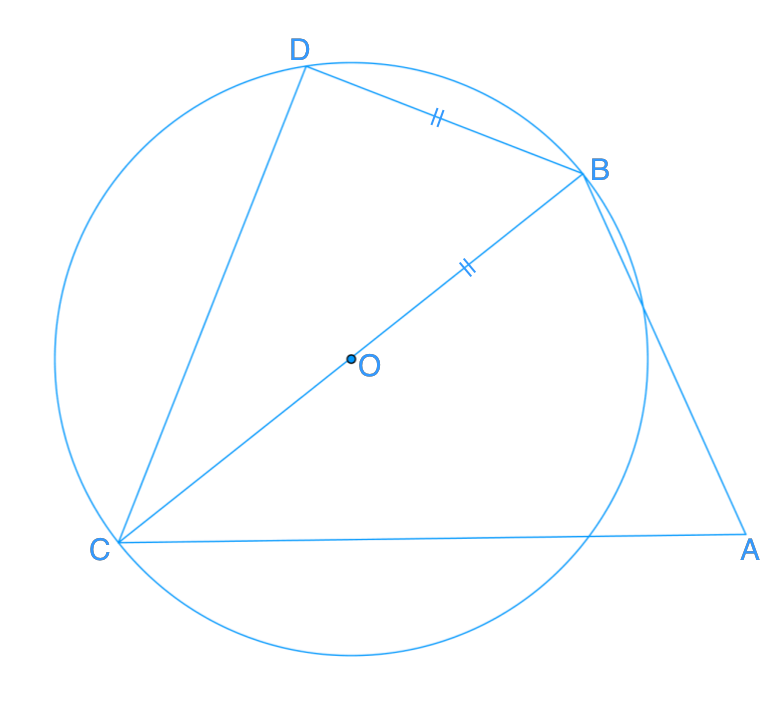 If there is a straight line connecting point D and point O, what type of triangle is △\triangle△BOD?